Do modern wheels still need balancing then? However precise the manufacture of wheels, tyres and discs is, mass-production means no item is perfect. Tyres and wheels can be out of alignment, out of shape, or have heavy spots on the rim of the wheel or tyre. How can I tell if my wheel is unbalanced? The problem is unequal weight on the rim of the wheel or tyre. As the wheel turns, spinning forces exaggerate this imbalance. Consequently, the wheel can noticeably oscillate at speed, like one of those wobbly overhead light/fan combos in the local Indian restaurant. On a bike, this can be felt as loose or wobbly steering at speed and harsh vibrations. An out-of-balance rear wheel is harder to detect as it is held in a rigid position – there isn’t a turning point that can be affected like the front end’s steering assembly. Any other effects from an unbalanced wheel? As the wheel tries to wobble itself out of alignment, vibrations make their way through the wheel spindle, which in turn stresses the wheel bearings, leading to premature wear. 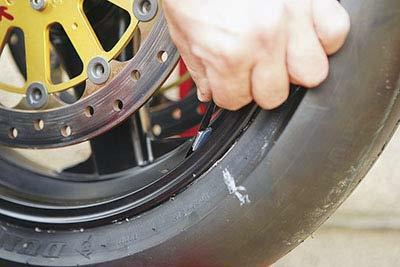 There’s also the danger that excessive vibrations could loosen various fasteners around the bike. 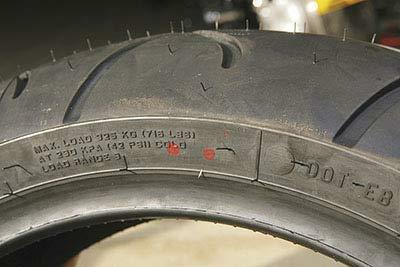 Tyres will also run hotter as the contact patch squirms and this leads to uneven wear. Aren’t wheels balanced when tyres are fitted? Yes, if the fitter supplies the tyres. If not, you get charged extra. But you can do it yourself. 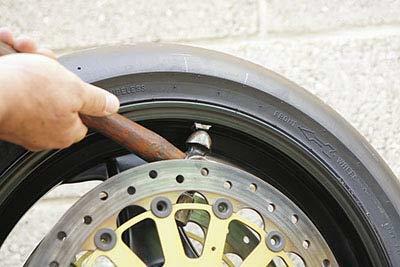 If you can fit your own tyres, balancing them is necessary and remarkably easy to do. The idea is to counteract the weight causing any imbalance by adding more weight directly opposite the heaviest point of the wheel to counter-balance it. 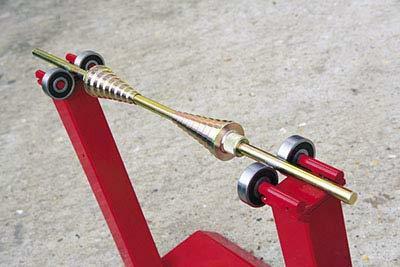 Attaching small weights to the rim, where the effect of centrifugal force is greatest, achieves this. These weights usually come in 5g and 10g sizes and are sticky-backed to keep them in place. Classic bike owners prefer lumps of lead/solder wrapped around the spokes. Motocross wheels are very rarely balanced as they use security clamps in the rim to hold the tyre on which are virtually impossible to counter-balance. 1. 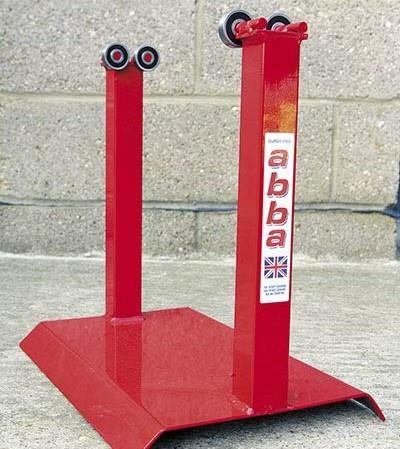 Professional tyre balancers are known as dynamic balancing machines. 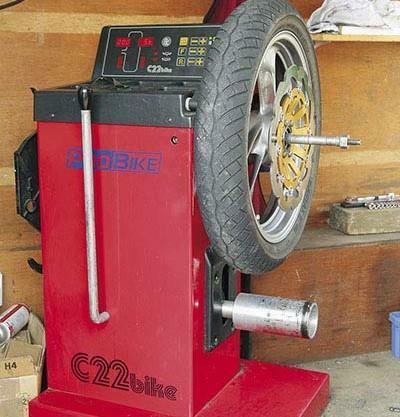 Basically, a bike wheel is clamped to a rod which is then turned at speed by an electric motor. Sensors detect the point of imbalance and by how much weight. These are expensive bits of kit – that’s why you have to pay for the service if you’re not buying tyres from the business. 2. 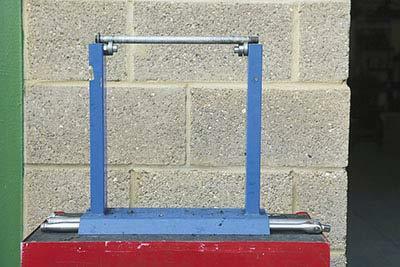 Static wheel balancers are very simple portable units that involve no mechanical trickery, just the skill of the man who balances the wheel. Construction is two upright supports with V-notches at the top of each support. The wheel, complete with spindle, bridges the supports allowing it to spin freely. 3. Static balancers that have pairs of bearings (or sharp-edged metal discs) bolted to the top of each support are the best kind as they allow the wheel/spindle to spin freely even if the wheel’s own bearings are worn or sticky. If the wheel can’t spin freely you won’t be able to balance it accurately, as the heaviest point may not end up lowest (see pic 8). 4. 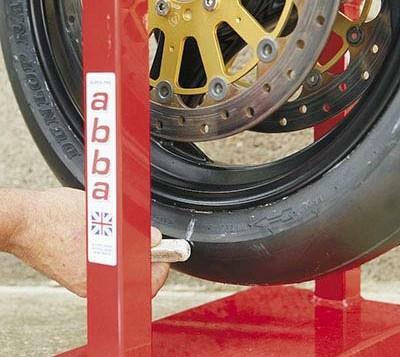 The best type of static balancer uses its own spindle with tapered cones to clamp into the wheel’s bearings either side of the wheel (£95 from Abba motorcycle equipment; 01621-854489). This balancer is truly universal and, with the addition of a £20 adaptor, single-sided swingarm wheels can also be balanced. 5. 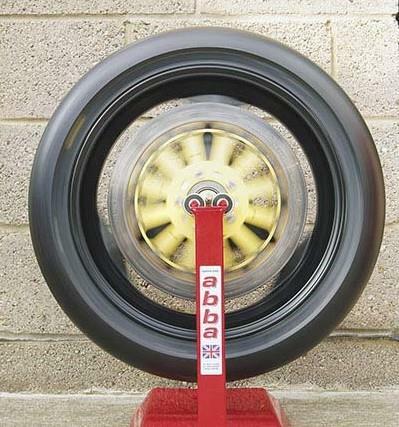 Time spent balancing a wheel can be reduced by ensuring a new tyre is correctly fitted to the rim. 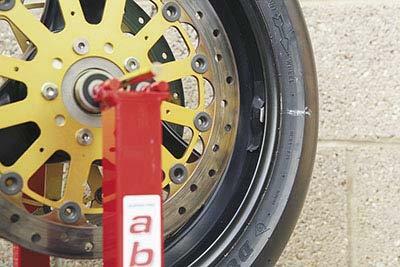 Most include a balance mark denoting that the wheel’s valve should be placed at this point when fitting the tyre – it balances out the point where the wire beading and rubber compound overlap. 6. 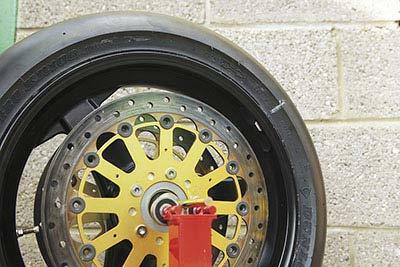 To balance a wheel, you must first remove any existing wheel weights from the rim. The sticky-backed sort are a pig to remove cleanly, but the simplest way is to insert a flat-bladed screwdriver between the weight and the sticky foam backing and gently flick off. Any residue left behind needs contact cleaner or nail varnish remover to get it off. 7. With the wheel set on the balancer, position the valve at the very top and gently spin the wheel – not so it spins at 50mph, otherwise you’ll be waiting all day for it to stop – with enough force for the wheel to complete three or four revolutions. If too much force has been used, slow the wheel down by finger pressure on the tyre. 8. When the wheel comes to rest, mark the position of the lowest (ie heaviest) point of the wheel with a piece of chalk. We'll call this 'point A'. 9. Now, with the wheel in the same position, mark the highest point of the wheel – this is the lightest point, or the ‘counter balance point’ (we’ll call it ‘point B’). 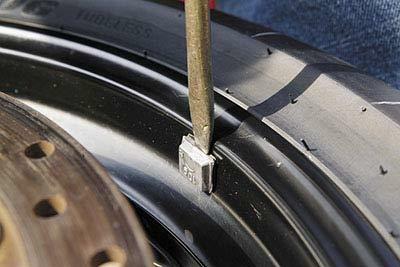 Take one 10g weight (buy a small assortment from a car tyre specialist) and place it on the flat, inside part of the rim at point B – secure with tape only, as you may need to add or remove the weight. 10. Set the wheel with point A at the 3 or 9 o’clock position and let go. If the added weight at point B goes back to the top, and point A back to the bottom, you need to add more weight – say 10g – to point B and repeat the procedure. If point B goes to the bottom, you need to reduce the added weight. You’re aiming for perfect balance. 11. This is achieved when, if point A is set at 3 or 9 o’clock, it doesn’t move. Once you have got to this point, gently spin the wheel so it spins 2-3 revolutions. When it comes to a halt, point A should be in a completely different position to where it was originally. If unsure, spin the wheel again. All being well, you’ll have a balanced wheel. 12. Remove the tape holding the weights in place and wipe the wheel rim at point B clean using contact cleaner or white spirit, and attach the weights using their self-adhesive backing surface. Tap gently in place with a hammer for a secure fix. If the total added weight is over 30g, divide the weight equally and place either side of the rim.